Dr Anita Takwale has been a Consultant Dermatologist and dermatological surgeon in Gloucestershire since 2008. She undertook her dermatology training in India (Pune) and in the UK (West Midlands, Bristol and Cardiff) and did her dermatology surgery fellowship in Cardiff. Anita’s interest in hair and nail disorders stemmed from her specialist training with Dr David de Berker and more recently with Professor Rodney Sinclair in Melbourne. She is currently the Clinical Lead for the British Hair and Nail Society and the dermatology surgery lead for the trust. She is former chairperson of the 3 Counties Skin Cancer Network, and the skin cancer lead for Gloucestershire NHS Hospitals Foundation Trust. She is member of the British Association of Dermatologists, British Society of Dermatology surgery, European Academy of Dermatology and Venereology and European Nail Society. Anita provides a secondary and tertiary hair and nails referral service for the south west region of UK with facilities for Diphencyperone immunotherapy for alopecia areata for the south west and strong links with dermatopathologist with an interest in hair and nail disease. 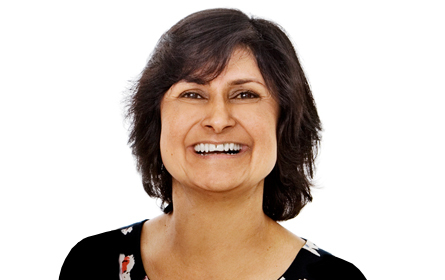 Anita has been a reviewer for British Journal of Dermatology and Clinical Experimental Dermatology for hair and nails papers, has published articles in peer reviewed journals, and has also written chapters for Lebwohl’s Treatment in Skin Disease and Brennan's Maxillo Facial Surgery. Dr Takwale holds NHS clinics in Gloucester and Cheltenham. Her day surgery lists for skin cancer, and the specialist hair and nail clinics, are held at Gloucester Royal Hospital. She undertakes private practice at the Nuffield Hospital, Cheltenham. She lives in Cheltenham with her husband, an orthopaedic surgeon, and has two daughters.